The March issue of Austrian magazine, Wien Live, is now on stands. Between the pages are plenty of fashion and beauty tips fit for spring. 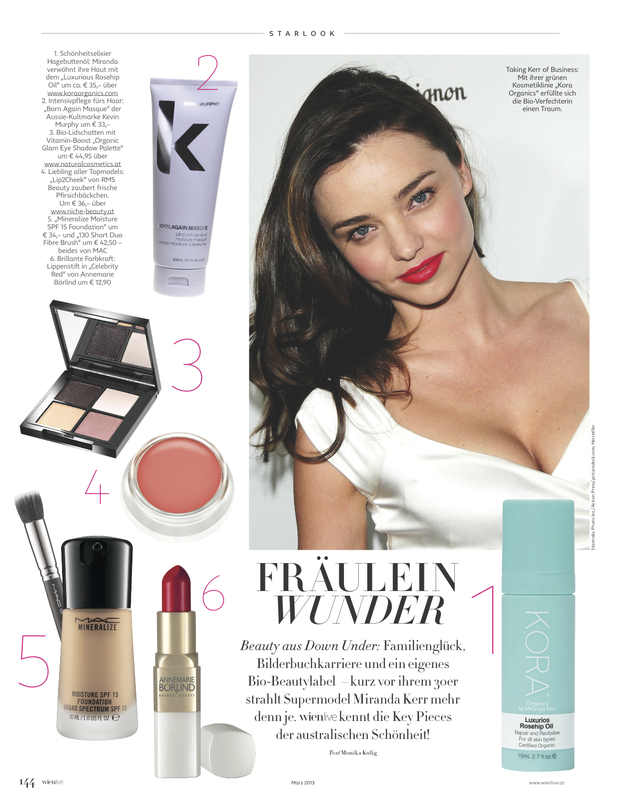 Dubbed Miss Wonderful, supermodel Miranda Kerr reveals how to recreate this gorgeous look using some of her favorite products. With glowing skin, she keeps it simple on the eyes while making her lips the center of attention. To get the beauty down under’s fresh, rosy flush, apply rms beauty‘s lip2cheek in smile. The coral-pink hue, which is perfect for spring, provides a pop of color that is both natural and lovely. If you’re in Austria or Germany, be sure to pick up all your rms beauty needs from Niche Beauty!